Barbed Wire Betties skate during practice on Wednesday, Nov. 9, 2016 at the Kishwaukee Family YMCA in DeKalb. The Barbed Wire Betties season opener kicks off on Saturday, Nov. 12 at Huntley Middle School at 6pm. 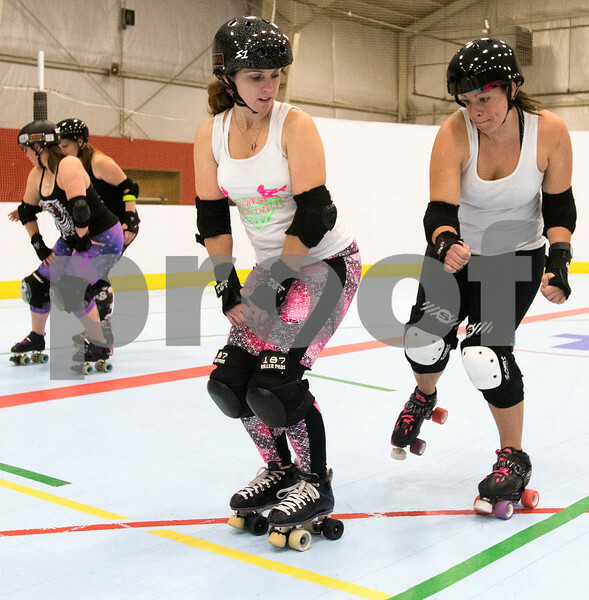 Katrina "Hurricane Katrina" Shrader, right, prepares to glide around Shonnah "ShoDown" Mills as the Barbed Wire Betties practice maneuvers on Wednesday, Nov. 9, 2016 at the Kishwaukee Family YMCA in DeKalb. The Barbed Wire Betties season opener kicks off on Saturday, Nov. 12 at Huntley Middle School at 6pm.